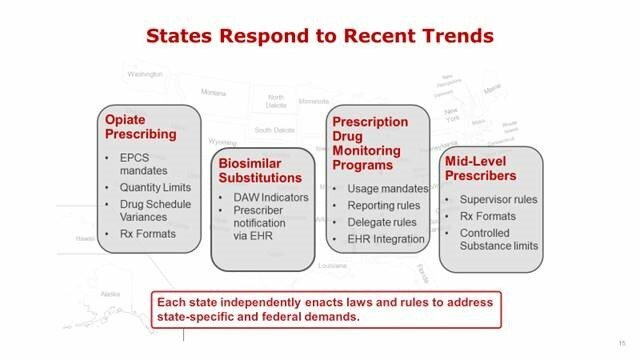 The State Law On-Demand research brief details enacted ePrescribing regulations for all 50 states and Washington, DC. Updated within the most recent 3 months, this one-time snapshot provides easy-to-reference data that simplifies regulatory tracking and helps development teams to be proactive in planning for system updates. In recent years, states began to enact new types of regulation to expand ePrescribing use, address opioid abuse and to support biosimilars. This year has been an explosive year for new legislative mandates, many of which directly impact how medications are prescribed through electronic health records (EHRs). The trend is rapidly accelerating, particularly as states attempt to reign in the opioid epidemic. In 2017, 265 new ePrescribing regulations were issued across states, nearly triple the number issued in 2016. Monitoring state ePrescribing legislation has always been important for vendor compliance for such things as prescription print and fax formats and rules regarding the ePrescribing transaction. All these regulations vary considerably by state and require constant monitoring to ensure products remain compliant and avoid situations that could place prescribers at risk for non-compliance. Is our latest research brief for state ePrescribing regulatory profiles for all 50 states and Washington, DC. Do you need a more comprehensive, ongoing subscription solution that includes one-on-one consulting support? The ePrescribing State Law Review combines access to Point-of-Care Partners regulatory experts with timely analyses of evolving laws and regulations governing electronic prescriptions. Click here for a comparison of these products.